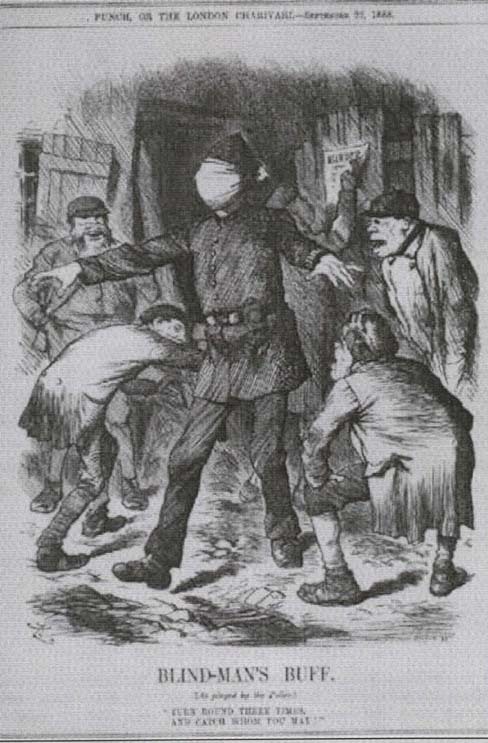 Title : “Blind Man’s Buff”, Punch , 1888; “The Great Whitechapel Puzzle”, London, 23 September 1889; “The Nemesis of Neglect”, Punch, 29 September 1888; “Two more Whitechapel horrors”, Illustrated Police News , October 1888. Cartoons prompted by the Jack the Ripper murders, highlighting police incompetence. Jack the Ripper is a nickname given to a never-identified serial killer who murdered and mutilated numerous victims in the poverty-stricken Whitechapel area of East London, England, in late 1888. The name originated in a letter sent to the London Central News Agency by an individual claiming to be the perpetrator of the crimes, largely committed against female prostitutes. Newspapers, whose circulation had been growing during this era, granted the murderer widespread and enduring notoriety because of the savagery of the attacks and the failure of the police to capture him.